Cambridge Reactor Design has unique solutions for delivering the best processes for three of the most important downstream processing operations - filtration/washing, liquid-liquid extraction and crystallisation. To help you gain full process understanding of your filtration/washing and liquid-liquid extraction unit operations and avoid frustrating scale-up issues, CRD has designed and engineered the Falcon Filtration and the Eagle Extraction Robot Assistants. These state-of-the-art platforms collect all the data needed to deliver understanding of your downstream processes by combining real-time machine vision with robotics, performing repetitive tasks, day and night, with high levels of precision and accuracy. Crystallisation perhaps poses the greatest challenge in process control. 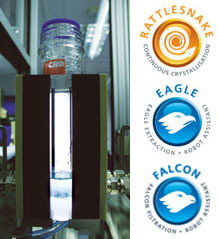 We have tapped into the inherently excellent control provided by continuous crystallisation technology to develop our Rattlesnake Continuous Crystallisation Concept. This equipment is designed to deliver multi-kilo quantities of material, but of course we have a small scale version for your process development. Cambridge Reactor Design Ltd proved to be an ideal partner when GSK Chemical Development wanted to introduce robotics downstream automation platforms to support our drug development pipeline. Bashir Harji and his design team took our basic concept and applied a multi-functional design and construction team to deliver a highly capable filtration and washing robotics system that we have now operational at a number of our sites. From the first equipment drawings through to site commissioning CRD were totally focused upon our requirements and very effectively provided technical solutions that worked. In use, the systems generate fast and accurate development information 24 hours a day to support downstream process scale-up and trouble-shooting activities. This capability supports our 'Quality by Design' strategy but is resource efficient due to the excellent control system, automation platform and data handling capabilities.